Th-INK-ing of You: LOC Royal Bouquet for you! Hello friends! Thanks so much for stopping by today! I have a card I made before I left for vacation using last month's new release from Layers of Color, May Bouquet cling stamp, and Royal Birds Clear Stamp Set. I just love the newest release... well, I love them all, but I really had fun playing with these! I stamped my image with Memento Ink on Cryogen White and colored with Prisma Pencils, blending with Odor Free Mineral Spirits. What I love about the Cryogen is that it has a shimmer to it so the paper itself gives that shimmer to your projects! I normally use it with Copics, but today I just tried it with Prismas.... it's been a while since I gave them some love! Anyhoo.... I cut it out and monted it on this Cheery Lynn Canadian Kaliedoscope Doily, and accented with the Cheery Lynn Fanciful Flourish. LOVE these dies!!! I then stamped the two birds from the Royal Birds set, and colored them with Copics, and I used Spica glitter pens on all the images. I mounted the images onto a piece of designer paper from BasicGrey's Sparkling Spring pad, which is on a base of SU! Blush Blossom. (So glad I got a pack before it was discontinued!!!) The ribbon is May Arts Silk. I hope you enjoy this card as much as I did creating it! Thanks for all the encouragement you always give! It means so much!!! Matt. 11:28 "Come to Me, all of you who carry heavy burdens, and I will give you rest." Absolutely stunning! The colors are beautiful. Thank you for sharing it with us at Frosted Designs! Absolutely gorgeous Grace!! So elegant!! I just love it!! I have to get those dies!! Had a great time with you this week my friend! !I hope you have a great time with your dear hubby!! Talk to you soon!! Great card! Thanks for playing in our Bugaboo Challenge this week. Wow, I love everything about this card! The birds, flowers, bow, everything! Thanks for joining us at CIC33. This is absolutely gorgeous, Grace! I love the colors and the beautiful images, which, of course, you've colored perfectly! Thanks so much for the beautiful card! It really made me smile at a time when I really needed it! I'm still unpacking, but getting there, slowly but surely. Hugs to you, my friend! WoW!!! What is left to say about your beautiful creation??? 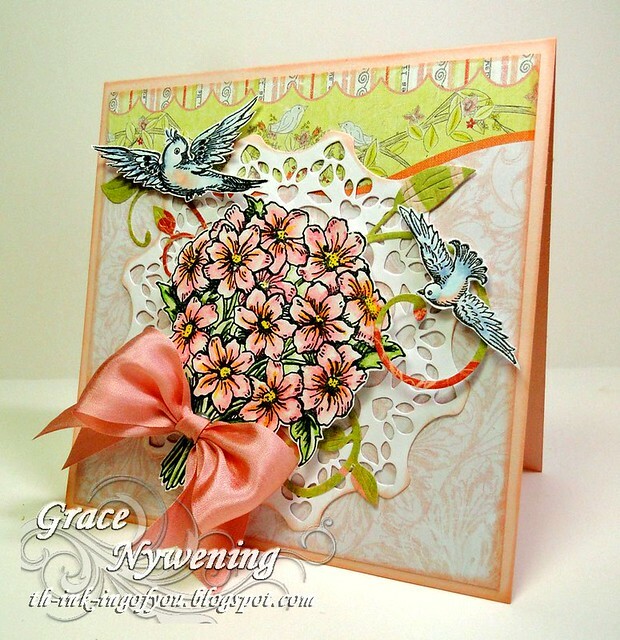 I am so impressed with your card...I am so happy to shared your project with us this week at DCD!!! What a lovely bouquet! Thank you for joining us at Die Cuttin' Divas this week. Hope you will be back again. Grace, I love your card, the birds are wonderful!! Have an awesome time on vacation!! You will have to tell us all about it!! This is gorgeous, Grace! Beautiful colors and detailing! Lovely card! Hi Grace~ This is gorgeous! I love the way you colored with your pencils...my fave when it comes to coloring. Those birds look stunning with the different colors and the pink...my goodness you have inspired me with this creation...I need birds now!!! TFS and have a wonderful weekend my friend! This is stunning Grace. Love the the bouquet tied with that gorgeous bow. This is beautiful. Love how elegant it is. This is stunning. Thanks for joining us at DCD. Stunning card, great image and colouring. love the bow holding the flowers together. Absolutely gorgeous! Perfect combo of images. What a beautiful card! As soon as it came up I said, "wow". Hope to see you Friday when challenge #34 is released. Beautiful and stunning flowers and birds. I love the colors so much. Thanks for playing along with us at Mami Doodles.